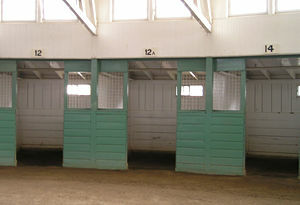 The number 13 is often avoided in public buildings, also floors, doors and this Santa Anita Park horse stall. A superstition is the irrational belief that future events can be influenced or foretold by specific, unrelated behaviors or occurrences. The earliest superstitions were created as a way to deal with ignorance and fear of the unknown. Superstitions are thus a way of attempting to regain control over events in one's life. Superstitious beliefs are more common among certain groups of people than others, and vary from culture to culture: For example, the number thirteen is considered by many in western society to be inherently unlucky whereas in Japan the number four is often considered unlucky. Some superstitions, notably the connection between mirrors and the soul, are however found to be almost universal, suggesting a deeper connection than mere happenstance or at least a universal experience and interest in such cases. While most superstitions are harmless, and even may be helpful in encouraging people to achieve their goals, attributing results to an unrelated cause if it leads to a lack of responsibility on the part of the person can be somewhat dubious. Understanding the true cause of phenomena is the deepest desire of human beings, and people should not abandon that endeavor in favor of superstition. The term superstition is thought to derive from the Latin superstitio, meaning "to stand over in awe." The term is also related to the Latin word superstes ("outliving" or "surviving"), and in this sense refers to the remains of ideas and beliefs that continued long after their original meaning had been forgotten. For this reason superstitions are often considered relics of outmoded ways of thinking. Many believe that superstitious beliefs originated during the earliest days of humanity. Faced with natural phenomena like thunderstorms and earthquakes, as well as the unpredictability of illness and food supply, human beings attempted to create an understandable world of powers that could be influenced by action. The earliest superstitions were created as a way to deal with the ignorance and fear of the unknown. Chance misfortunes could be ascribed a cause, and the potential to avoid or control them was created. Superstitions are thus a way of attempting to regain control over events, particularly when one feels helpless. Some groups are more prone to superstitious beliefs than others. Actors, miners, fishermen, and gamblers all tend to be more superstitious than average; the success of all these occupations tends to be more out of the control of the individual. Often, superstitions are born from casual coincidence. For example, if an athlete wears a particular pair of socks on a day he performs particularly well, he may continue to wear the same pair of socks in the belief that the socks were responsible for the success. Future successes reinforce such a belief. In some cases, it is certainly possible that the simple belief in success or failure can influence the outcome. The athlete who cannot find his "lucky socks" may, due to lack of confidence, perform poorly, further reinforcing the belief in the power of the socks. Superstitions can also be learned behaviors. Children who watch those around them perform superstitious actions like "knocking on wood" or not walking under ladders may adopt these behaviors. The true origins of certain superstitions can be centuries old, having been passed down from generation to generation through such an observational learning process. In 1947, Behavioral psychologist B. F. Skinner, known for his experiments using the famed "Skinner Box," published research on the behavior of pigeons in which he observed what he termed "superstitious" behavior. The group of pigeons, kept hungry for the purpose of the experiment, were fed small amounts of food at regular intervals, unrelated to the pigeons' behavior. By the end of the study, three-quarters of the group of hungry pigeons had developed what he called "superstitious" behaviors. One pigeon practiced turning clockwise several times, apparently expecting the appearance of food; other birds developed specific head movements. Later studies by other psychologists failed to replicate Skinner's results and disputed Skinner's "superstition" explanation for the behaviors he recorded. Instead, it appeared that the behavior of his pigeons could be accounted for by the natural foraging behaviors of the species he used as test subjects. Religious beliefs have often been viewed by those outside of a particular religion as nothing more than superstition. Religious practices are most likely to be labeled "superstitious" by outsiders when they include belief in extraordinary events, supernatural interventions, apparitions, or the efficacy of prayer, charms, amulets, incantations, the meaningfulness of omens, and prognostications. While superstitions may seem to have parallels with religious practices, and some may seem to overlap more than others, there are important distinctions. Prayers, rituals, and other religious acts are generally performed to venerate a deity. By offering prayers, sacrifices, and so forth, one may hope that the deity looks favorably upon them, but the power exists within the deity, not the performance of the ritual or prayer. The power of objects such as amulets similarly comes through the object, but such power originates with the deity, not the object itself. Superstition, on the other hand, puts all power in the action or object itself, or the person performing the action. For example, a religious person may sacrifice an animal to ensure a good harvest. The success of the harvest is thus put into the hands of the deity. A superstitious person may perform a certain ritual for the same purpose, but the success of the harvest is thus dependent on the power of the ritual itself. The Roman Catholic Church considers superstition to be sinful in the sense that it denotes a lack of trust in the divine providence of God and, as such, is a violation of the first of the Ten Commandments: "You shall have no other gods before me." The Catechism of the Catholic Church states superstition "is the deviation of religious feeling" and "can affect the worship we offer the true God." "[Attributing] the efficacy of prayers or of sacramental signs to their mere external performance, apart from the interior dispositions that they demand, is to fall into superstition." Superstitions are often passed down through generations; often, the origin of a superstition is lost to history. Additionally, while some superstitions seem more widespread (like the connection of mirrors to the soul), others are specific to certain cultures or occupations. Objects are often viewed as lucky charms. Types of charms include rabbits' feet, four leaf clovers, and horseshoes. Horseshoes are often hung above doorways; when placed with the ends upward (resembling the letter "U"), the horseshoe is thought to collect luck. When placed with the ends pointing downward, luck supposedly drains. Numbers are often given power. In western cultures, the fear of "unlucky" number 13 is called triskaidekaphobia. Some cities skip "13th Avenue," and some buildings go directly from the 12th floor to the 14th floor. The thirteenth floor/apartment/room is sometimes labeled "12a" in an attempt to lessen confusion (being on the "fifteenth" story of a fourteen story building, for example.) Interestingly enough, the same number 13 was once considered a lucky number in ancient Egypt and China, as well as modern Japan. In eastern countries like China, Japan, and Korea, tetraphobia (fear of the number four) is common, instead, possibly because of the similarity in pronunciation of the word "four" and the word "death." Numbers that contain "4" are often skipped in building floors and apartment numbers, as well as table numbers during weddings. "4," "14," "24," and so on are commonly replaced with "3a," "13a," "23a," and so forth. A large number of superstitions are of the "if you do 'x,' then bad luck will follow" variety. Walking under a ladder, opening an umbrella indoors, spilling salt, and putting new shoes on the table are all examples of actions that will cause bad luck. In some cases, it is possible to "undo" the action or protect against bad luck. Crossing one's fingers while walking under a ladder, and throwing salt over the left shoulder after spilling it are often thought to nullify the bad luck. Mirrors have often been the subject of superstition. Many cultures have believed that mirrors were capable of trapping the soul. The ancient Romans believed that breaking a mirror would also break the reflected soul of a person. The belief that life renewed itself every seven years led to the most common superstition about mirrors: A broken mirror will create seven years of bad luck. The Romans believed that such a result could be avoided by grinding the mirror shards to dust, where no shattered reflections remained. Early American slaves submerged the broken mirror into a stream of southward flowing water, and believed bad luck to be washed away in seven hours. Other superstitions involving mirrors also illustrate the belief that the soul can be trapped by them: Mirrors are sometimes covered during illness or after death so that a soul might not accidentally wander through a mirror and become trapped. In northern India, it was believed that looking into the mirrors of a house you were visiting could cause part of your soul to be trapped in the house when you left, opening you up to manipulation by the owner of the mirror. Animals are also often the subject of superstition. If a black cat crosses one's path, it is a sign of bad luck. Birds flying into one's house are thought to be a sign of an impending death. There are also a number of superstitions specific to certain occupations. Sailors believe it is bad luck to kill an albatross, as an albatross is thought to be the spirits of dead sailors. Some superstitions, such as the actors' "don't whistle in the theater," have their roots in practicality. Backstage workers in theaters used to whistle to communicate with one another as they raised and lowered scenery and lights; the whistling of an actor could inadvertently cause a scene change or injury. ↑ Monica-Maria Stapelberg, "Old Wives' Tales?" Zeus Publications. Retrieved May 17, 2007. ↑ Sacred Texts, "The Origins of Popular Superstitions and Customs: Introduction" Retrieved May 17, 2007. ↑ Mark Griffiths and Carolyn Bingham, "A Study of Superstitious Beliefs Among Bingo Players" (UK: Nottingham University). Retrieved June 30, 2007. ↑ Hypnotic World Psychology, "Superstition: What the Pigeons Can Tell Us." Retrieved May 17, 2007. ↑ Roman Catholic Church, "Catechism of the Catholic Church." Retrieved May 17, 2007. ↑ Robert Todd Carroll, "triskaidekaphobia" The Skeptic's Dictionary. Retrieved May 17, 2007. ↑ Myrriah Lavin, "The Mirror" Obsidian Magazine. (1999). Retrieved May 18, 2007. Codrington, R. H. 1891. The Melanesians. Oxford. Frazer, J. G. 1911. The Magic Art and the Evolution of Kings, Volume 2 (the Golden Bough). London. This page was last modified on 8 October 2008, at 21:01.